Kathy Keithley '78 reports: "(TCHS) Templar (yearbook) - placed first in yearbook sweepstakes at this year's Eastern Los Angeles Journalism Education Association On-the Spot Write Off Competition. Rampage scored fourth in sweepstakes and TCHS earned third in super sweepstakes. The team of Valeria Chavez, Victoria Tran, Sophia Juan and Kayla Truong placed third in yearbook layout and fourth on copy. Jevana Liu, Ashley Peng, Elyse Cuevas, and Nancy Trinh's team placed 7th in yearbook layout. Yearbook staff Michelle Xian placed first in news photography and LeAnn Trac placed first in feature photography. Annika Chong and Jasmine Tran both placed for their photography submissions. "Rampage newspaper staff member Philycius Tjong placed second in news writing. 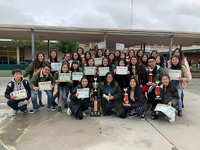 Rampage staff Kailyn Huang, Christina Zhang, Thalia Loi, Zoe Hsu, Kaiya Pomeroy-Tso, Kathryn Hoang, Steven Salas, Tuan Nguyen, Jackie Sun, Elisa Xu, Matthew Kwan and Michelle Le all placed in their competition categories."